Tribune creditors want their pound of flesh from the troubled Chapter 11 media company -- $250 million pounds of financial flesh to be exact. Just one day after a judge OK’d big 2010 bonuses for hundreds of company executives, the Committee of Unsecured Creditors asked the court for the right to claw back hundreds of millions in bonuses and stock paid out to Tribune Company officers and directors, past and present, in 2007 and 2008. This particular set of creditors, as others involved in the 23-month bankruptcy case have before, also asked the Delaware court for permission to pursue legal action against current Tribune owner Sam Zell and possible future owners such as JPMorgan Chase, a past lender and creditor itself, for their role in the effort to take the company private in late 2008. Internal dishonesty is what worries the creditors, say one of their lawyers. A spokesman for Tribune told TheWrap the company had no comment on the matter. U.S. bankruptcy law gives courts the power to reverse and recoup awards granted to a now-bankrupt company’s executives and directors in the year leading up to its Chapter 11. All funds recovered are usually dispensed to petitioning creditors. Tribune submitted its latest comprehensive reorganization plan to the bankruptcy court on Oct. 22. The plan is supported by major creditors JPMorgan Chase, New York equity firms OakTree Capital Management and Angelo, Gordon & Company and the Committee of Unsecured Creditors. Tribune Co. creditors would receive about a third of the money they are owed -- plus a stake in a fund that will bankroll buyout lawsuits -- according to its plan filed in U.S. Bankruptcy Court in Delaware. The bankruptcy plan gives creditors $420 million, or about 33 percent of what they originally had coming. The terms are more generous to bondholders than previous proposals. Strategically unsurprising, Thursday’s filing secures the Unsecured Creditors' legal rights to pursue further action against Zell and others if it decides to. The move doesn’t reflect a breakdown in the reorganization plan or their support for it. Other creditors, such as bondholder Aurelius Capitol Management submitted their own reorganization plans for the company on Oct. 29. 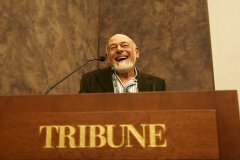 Declaring that Aurelius’ plan “offers a surer and quicker path for Tribune to emerge from bankruptcy,” company Chairman Mark Brodsky said late Friday “Tribune was bankrupted by a transaction that the court-appointed Examiner found to have been fraudulent. Tribune’s plan is supported by major creditors JPMorgan Chase, the Committee of Unsecured Creditors and New York equity firms OakTree Capital Management and Angelo, Gordon & Company – in fact, the company’s proposal is heavily based on one the latter hedge funds put forth in September. The storm clouds of the creditors reorg plans came on the same day that various hedge funds in the company’s bankruptcy sued JPMorgan Chase, Bank of America and Citigroup over the 2007 buyout that took Tribune private. The suit alleges that the banks knew the deal would ultimately fail but went ahead "improperly motivated by tens of millions of dollars worth of fees and the desire to curry favor” with Zell. Hearings on the various plans are expected in late Nov, with creditor voting not long afterwards … or, as has been common in this Chapter 11 saga, it could all change again. The Chapter 11 case and the machinations to find a way out of the courts hasn’t been the only crisis at the company of late. Amidst late summer reports that former Disney CEO Michael Eisner may become Chairman, Tribune has seen the messy departure of Chief Innovation Officer Lee Adams and CEO Randy Michaels in the last two weeks. The duo was at the center of what was being referred to as frat-boy behavior in the company’s executive offices. Tribune is now being run by a four-member executive council of Don Liebentritt, chief restructuring officer, Nils Larsen, chief investment officer, Tony Hunter, president, publisher and CEO of Chicago Tribune Company, and Eddy Hartenstein, publisher and CEO of Los Angeles Times.